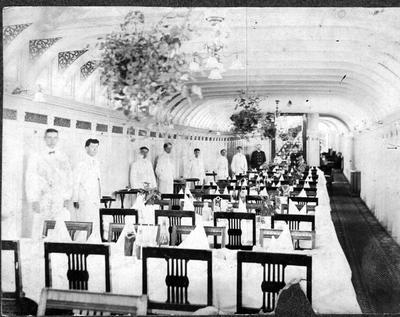 Black and white photograph of a ships dining room with tables set for dinner taken sometime between 1906 and 1911. Ship was running from Owen Sound to at least Meldrum Bay on the Manitoulin. Napoléon Dubé is the smaller man next to the man in the dark suit.